I appointed myself the family historian a few years ago and I've been searching records online in hopes of building a decent family shrub, at least, if not a tree. A couple of weeks ago, I mentioned how actual historical records could potentially inspire a historical fiction. In that same post, I talked a little about my Talbot ancestors. They are my paternal grandmother's mother's family and they've always interested me because they're my first ancestors on American soil. My great-grandmother, Annie, was born in New Jersey in 1894--my first American-born ancestor--while my other three great-grandparents on the Irish side of my family were all born, raised, and immigrated from Ireland. I knew Annie Talbot had a rough childhood. Her parents both died when she was very young and she'd been sent back to Ireland to be raised by her grandmother, then she came back to the United States in 1912; this is stuff I've heard through family stories that I was able to find through paper trail records. But this left me with questions: when did Annie's parents die? And how? Well, I found out the dates when I looked through Ancestry.com's indexes of New Jersey death records. Edward Talbot died in 1901 and Annie Cassidy Talbot, his wife, died in 1899. I ordered Edward and Annie Talbot's New Jersey death records in hopes to find out more about them. I don't know when they married, I don't even know when they immigrated from Ireland, so looking at the death records was going to be my best chance at maybe figuring out when those events may have occurred. And I was right. Annie Cassidy was 33 when she died in 1899 of pneumonia. She'd had a lot of babies who seemed to not thrive, so I wondered if she'd died of something childbirth-related, but it seems not so. 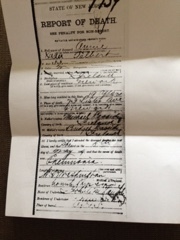 Also, while the certificate only listed her birthplace as "Ireland," it had her parents' names on it! Michael and Bridget Cassidy, my great-great-grandparents. Also, bonus, the record said that Annie had been living in New Jersey for 19 years, so approximately since 1880. Also, she was older than Edward by about four or five years. Edward also died of pneumonia at the beginning of January 1901 and while his parents aren't listed on his death record (I already know who they are anyway), it says that he lived in New Jersey for about 15 years. So...Annie was here first. But now that I know how long they were here and when approximately they arrived, I can maybe better pinpoint an immigration date. Sadly, it's before Ellis Island, so I think maybe the records are a little sloppier. Cool! My mom's told me a little bit about it and such. I can definitely see how it's helpful. It's also really fun to see migration patterns. The ancestors on my grandmother's side were in Scotland, then Yorkshire, Canada, North Carolina, and finally Tennessee. My ancestors didn't go very far lol Ireland-->New Jersey or Ireland-->The Bronx.